We were standing in an Ace Hardware store up in California’s Sierra Nevada range. This was gold country long ago. Mark Twain once did a gig here back in 1868. One hundred-fifty years ago is ancient history to Americans, or at least to Californians. But there I stood with Doss, though I never quite figured out how he stepped from the pages of The Grapes Of Wrath and into the hardware store. I didn’t know him in his prime, but I’d seen the photos. Well into his fifties he was still as broad across the back as a bodybuilder. Now he shuffled, but he didn’t seem to mind. “Oh, my whole family came out in a Model T pickup. We had to get out of the back on hills or the front wheels would come off the ground.” He laughed and demonstrated with his arm how the truck nose tipped upward. We shuffled past a display of hand-built birdhouses. “Would you look at that?” He said, and he picked one up. Because the Pyro was an ammunition ship it was targeted by the Japanese. A direct hit and the whole fleet may have gone up. Fortunately the Japanese had faulty information and they rained hell on the abandoned ship next to the Pyro. Sadly I can’t remember how long Doss told me he spent down in the hold handing up ammo. Twenty hours comes to mind, but I don’t want to lie to you. But twenty minutes or twenty hours, his arms must have burned from the work, no matter how big of a man he was. His eyes and lungs must have burned from the thick black smoke. His nostrils surely burned from the death hovering in the air. His ears and mind surely burned from the explosions and guns, the droning engines and the screams. Doss, down in a dark hole, sitting on top of a powder keg, doing his work while the world burned. When we got back to his trailer I cut him a slice of the pie I made. It wasn’t easy. Trans fats had just made the news, so this was my first shortening-free crust. Doss sat there with his pie and his glass of milk, eyes closed while he chewed. He savored each bite — no matter what he was eating — a broad smile encroaching on his ruddy cheeks. I cringed each time his forearm trembled, trying to work his fork through the tough crust. “An aircraft carrier, wasn’t it? “That’s a terrible story. We were hit by a kamikaze. Those poor fellas were brainwashed. They thought their emperor was God, but there’s only one God.” He quoted a Bible passage, but I don’t recall which one. I’m a college graduate and “Jesus wept” is the only bit of scripture that I can accurately quote from memory. Doss had an eighth grade education but could pepper his conversation with Bible passages at will. His dog-eared, note-crammed Bible was always near his chair. “Oh, it was. So many men burned up. I had to go find the bodies.” We sat quietly. I wasn’t sure whether Doss was still in there, and if he was I didn’t want to push. Finally he stood and shuffled across the living room. Out in the West Texas town of El Paso — he sang. He pulled an album from the shelf, worked his way back across the room and handed it to me. Doss Younger Thornton: trapper, sailor, Dust Bowl migrant. Gold panner, builder of humble birdhouses. Survivor of the attacks on Pearl Harbor and the USS Bunker Hill. The kindest, most decent man I’ve ever known. D.Y. Thornton, I remember you. Bless your heart, thank you. What a good story. I also like a pie crust with a little fight to it. Thank you. Your next pie is on me. 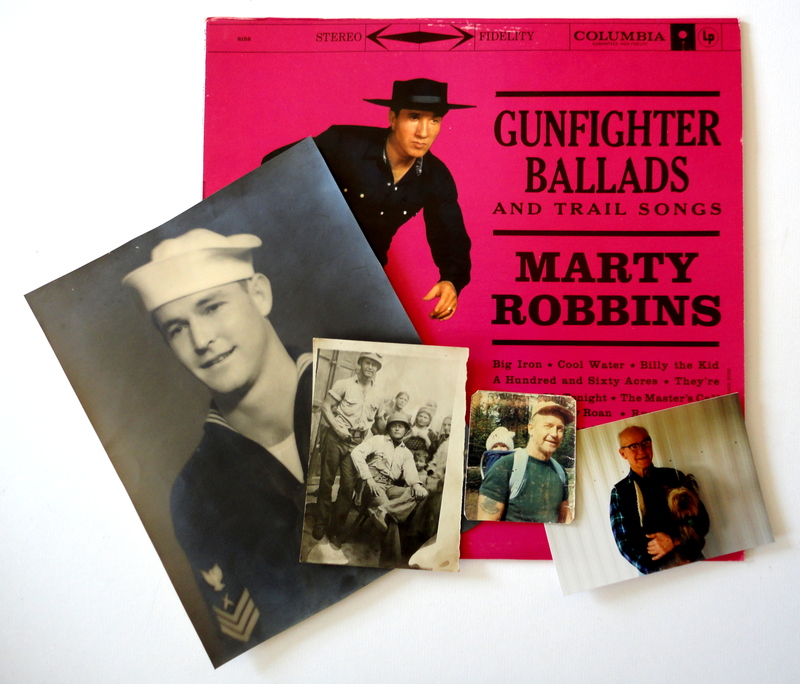 I listened to the Marty Robbins album when I was a kid. I think I know all the songs by heart. Also love Hoyt Axton.